Our World is happy to be back in Masset BC on Haida Gwaii! 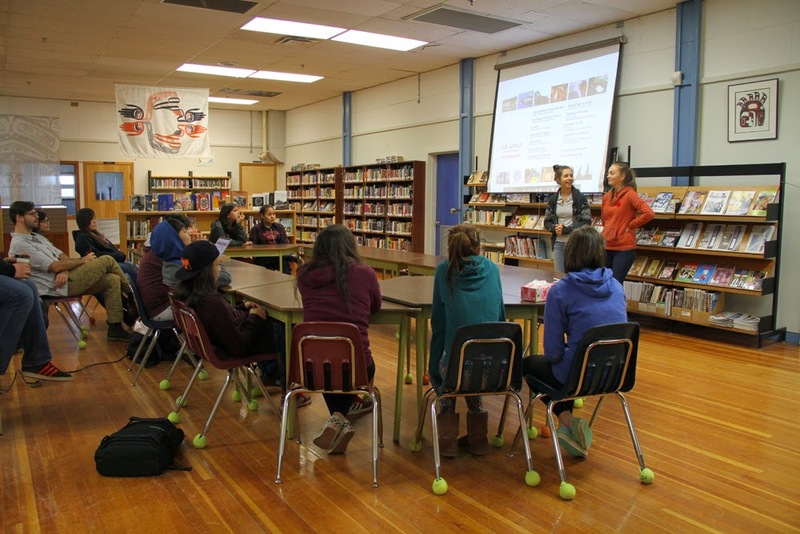 We are working again with students at George M Dawson High School and today we get to take over the library. Everyone is so helpful...feels good to be here. We have nine great grade 9 students this year who are able to dedicate their school days to filmmaking for almost 2 full weeks! Today we get to know each other and search for inspiration on what kind of films to create. Luckily we have some young filmmakers from last year who made films and they screened their films and talked about the filmmaking process - Big Thanks to Elijah & Rayne and Edda who joined us to chat. Also fun,joining Lisa g and Elisa Chee and the Our World team is Nang Ḵ’uulas (Patrick Shannon) - Patrick is Haida and raised in HG and has a film/design company in Skidegate and he welcomed the students in the Haida language and set the stage for language being an integral part of the projects! 4. Carol, Zaya & Annie want to make an opinion piece about the issues surrounding body image and unrealistic expectations set up by media, designers and advertising. After school we make a quick trip to Old Masset to borrow a computer and monitor. An extremely productive first day! Old Crow - Screening Day!